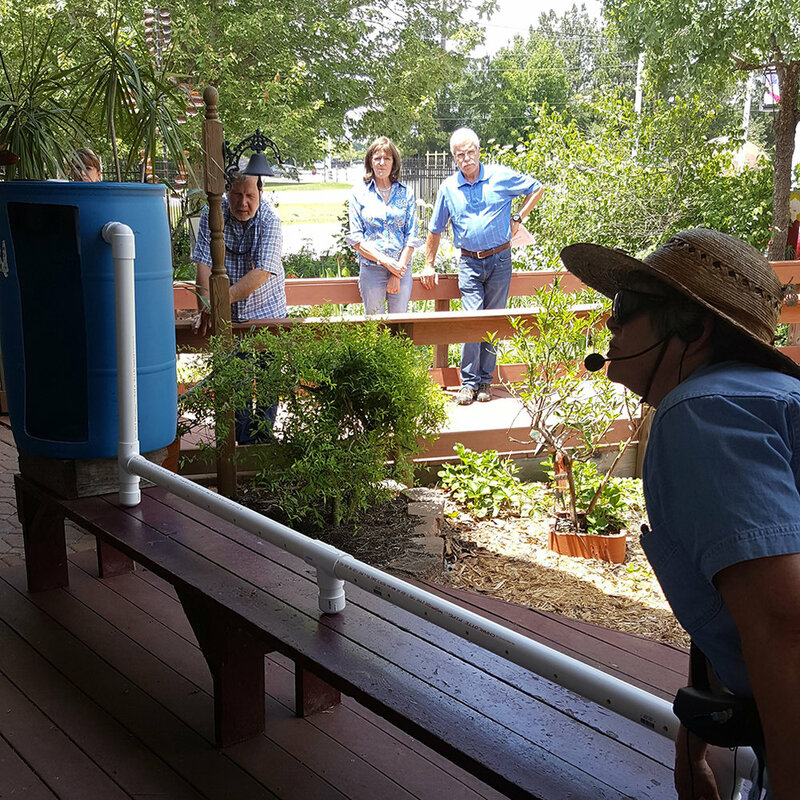 In this May 11, 2018 photo, Rainwater Specialist Jim Bundscho leads attendees on a tour of the Montgomery County Extension Office grounds. Dozens gathered Friday, May 11, 2018, at the Montgomery County Extension Office to learn about rainwater harvesting for irrigation, livestock, wildlife, and firefighting. The workshop was co-sponsored by the Montgomery County Texas A&M Agrilife Extension, the Lone Star Groundwater Conservation District, and The Woodlands Joint Powers Agency. Dr. Dotty Woodson, an extension program specialist for water resources, led the day-long class. Woodson kicked off the workshop highlighting the need for Texas to continually explore alternative water sources. Projected population growth, especially around the Greater Houston Area and Dallas-Fort Worth Metroplex, has many water resource planners investigating a variety of potential solutions to meet future demand—including innovative applications for graywater, air conditioner condensate, recycled water, and rainwater harvesting. More widespread adoption of rainwater harvesting, Woodson said, would not only reduce demand on public water suppliers, especially during peak usage in the hotter months, but could also help reduce flooding as a stormwater mitigation strategy. Moreover, as an irrigation resource, plants, she explained, prefer rainwater over the more minerally-rich chlorinated water distributed through public supply systems. She even cited the usefulness of rainwater harvesting as a firefighting tool in regions where water is either scare or not connected to a municipal supply. She gave a nod to West Texas’ McDonald Observatory, its 80,000-square-foot stormwater catchment, also known as the parking lot, and its 20,000 gallon storage tank specifically dedicated to fire protection. Meg Davis, Mike Mendeck, and Jim Bundscho, rainwater harvesting specialist with Montgomery County Master Gardeners, also led attendees on a tour of the Extension Office grounds and its numerous rainwater harvesting demos currently on display to the public. To learn more about rainwater harvesting, visit LSGCD’s resources page at www.lonestargcd.org/resources. Join LSGCD’s Water Efficiency Network mailing list and keep tabs on all the upcoming conservation-related happenings in the area; visit the following link to sign up: https://goo.gl/hCHkbi.